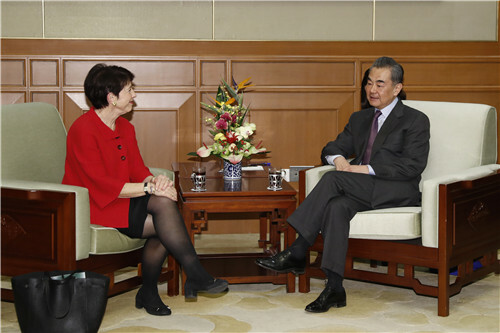 On February 28, 2019, State Councilor and Foreign Minister Wang Yi met with former Deputy Assistant Secretary of State Susan Shirk of the United States (US) in Beijing. Susan Shirk delivered the report "Course Correction: Toward an Effective and Sustainable China Policy" which was written by her as the initiator and other US scholars. Susan Shirk also introduced the relevant background of issuing this report, and hoped that the US and China could carry out cooperation in extensive areas and resolve divergences through negotiations. Wang Yi expounded on the Chinese side's policy and proposition on developing China-US relations. Wang Yi expressed that this year marks the 40th anniversary of the establishment of China-US diplomatic relations, and both sides should take this as an opportunity to earnestly sum up experience, jointly open up the future, and stick to the right direction of the development of China-US relations. It is hoped that the US could treat China's development and the extensive common interests between the two countries objectively and rationally, and promote the China-US relations based on coordination, cooperation and stability together with the Chinese side in accordance with the important consensus reached by the two heads of state.